Lama Norbu Töndrub was one of Kalu Rinpoche’s root lamas and his retreat master during his three-year retreat at Tsadra Rinchen Drak. 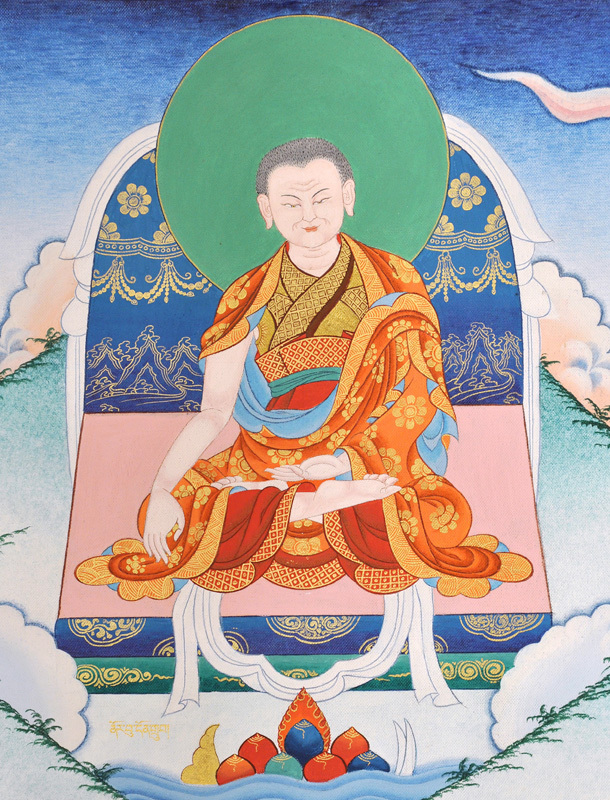 Lama Norbu Töndrub had first been a monk at Palpung Monastery. Then, because of his great qualities as a practitioner, he was appointed by the 11th Tai Situpa Pema Wangchok Gyalpo (1886-1952) as retreat master, a function which he held for 12 years. From then on, he devoted the remainder of his life to solitary retreat. He is often said to have received the Shangpa Kagyü transmissions and instructions from Jamgön Kongtrül Lodrö Thaye himself, but he must have been very young if that was indeed so and if his birth year of 1880 is indeed correct. 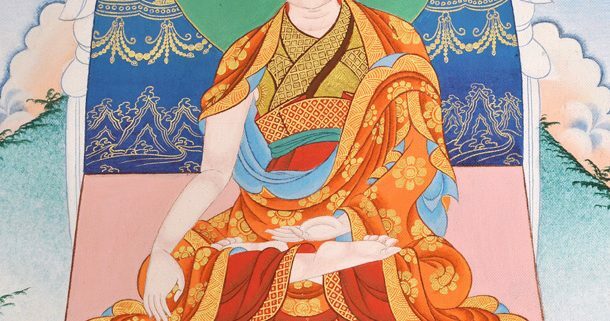 It is therefore rather more likely that he received actual guidance in the Shangpa practices and teachings not only from Kongtrül, from whom he may have received the empowerments and even oral transmissions at a young age, but also from either Khenchen Tashi Öser or Khedrub Tashi Chöpel, or both for that matter. They were two of the oldest and closest disciples of Kongtrül’s at Tsadra. Having been the principal lineage-holder of the teachings and transmissions of the Shangpa Kagyü at the time, prior to the arrival of the young Kalu Rinpoche at Tsadra Rinchen Drak, he dreamed of the Six-armed Mahakala one night, the main Shangpa protector, who appeared with a white silk-shawl, to welcome the new lineage-holder. Over the course of the following years Lama Norbu Töndrub then passed the entire transmission on to Kalu Rinpoche. Kalu Rinpoche is reported to have said: “Since Lama Norbu Töndrub was 40 years old until he passed away, he had only been living in retreat. At 70, he rooted out all the attachments to worldly appearances, merging the states of meditation and post-meditation. At 74, his mind dissolved in the sphere of reality, and being left as a relic, his body took on the appearance of an eight year old child. When the mandalas of the four great tantras were opened and the body offered to the fire, many rainbows appeared during the whole day and relic pills of various colors were later found. These different signs show very clearly that he had actually reached the state of the Great Non-Meditation according to Mahamudra terminology or the Great Exhaustion of Reality according to Dzogchen terminology.” That is to say he reached the level of buddhahood. During the funeral ceremonies, which were presided over by Kalu Rinpoche, his heart was not burned by the fire and was later enshrined in a stupa. Besides the relic pills and the rainbows, a rain of flowers occurred. The present 12th Tai Situpa, H.E. Pema Dönyö Nyinje Wangpo, spoke about that, having himself been told about this event by a reliable eyewitness. The sky was clear. Nevertheless small drops made of a cotton-like substance and containing water were falling down. The sun was reflecting on them, giving an impression of rainbow flowers. Once these drops reached the ground, a thin downy substance would eventually be left on the floor. The facts that Lama Norbu Töndrub’s body got so small as to reach a child’s size, and that rainbows appeared in the sky over the funeral pyre, show clearly that he had actually attained the rainbow body. According to the present Situ Rinpoche, this was not uncommon in Tibet but rains of flowers were really exceptional “like a white elephant” he said.